Remember way back when “social media” was a new thing? Even back then a few wise heads expressed doubts about the ultimate good or ill of it all. Since then not only has the novelty worn off, Facebook and the others have become a pervasive presence in our lives. Perhaps perniciously so. I’ve always been suspicious of a business that purports to give you something for nothing, and the history of Facebook has hardly proven such suspicions unfounded. Is connectedness valuable? Sure! But so is privacy. Perhaps preciously so. A guy named Ross Douthat recently argued that if we really want to regain some of our privacy, we will need to set some limits. We will need to establish internet-free places and spaces. We will need to experience reality before it becomes virtual. We will need to rediscover ways to interact and socialize that don’t depend on smart phones. This sounds like good advice, so we’re passing it on. And while we’re at it, here are some suggestions for places and occasions where just such reality-based socializing can be enjoyed. But down that phone and pick up a beer, Wisconsinites. So say us. The Sparks Band again? Yes. This time at Me&Julio. Eat, drink, listen, dance, go home and go to bed. (You know you want to.) 6 to 9 pm. Hear one of the best jazz big bands in the WORLD! For FREE! (All true! No feces!) Airmen of Note are the official United States Air Force jazz band, and they play The Mitby Theater at Madison Area Technical College’s main campus. Great band. Beautiful venue. Click here for FREE tickets. Check back for more May, June, and July dates and late-breaking McMusical news. We’ve said it before (in so many words), so why not again? Our wacky wintry weather (topic of conversation numero uno), just keeps comin’. Don’t succumb to SAD. * Take advantage of a predicted Friday break in the pervasive precipitation to toast the end of the week with Big Wes Turner’s Trio at the High Noon Saloon. Doors open at 4:30, so punch out early. The "biggest little band in Madland" starts up their "Rockin’ RHYTHM & Swingin’ BLUES" at 5 and goes through to 7 pm. Many Madisonians depend on the official heralding of “The Weekend” that is heard without fail every Friday (mostly) at 2 pm on WORT’s long-running, highly acclaimed, somewhat notorious giggle-and-snort fest, The Mel & Floyd Show. See that you segue yourselves from there to the High Noon Saloon. 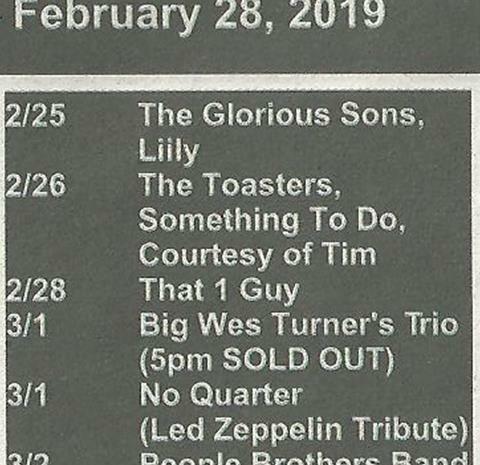 Note: Despite the recent listing in Maximum Ink indicating that this High Noon “Happy Friday” gig was “SOLD OUT”, such is not the case. More on this here. Turner returns! Big Wes Turner’s Trio (the biggest little band in Madland) plays Rockin’ RHYTHMN & Swingin’ BLUES for “Happy Friday” at the High Noon Saloon. Can you say, “It’s Madison time!” 5 to 7 pm. No cover. Lotsa beer. The Cashbox Kings hit the Rothschild Pavilion at 5 pm to help celebrate 20 years of Wausau’s Blues Café. Other performers: The Mark Cameron Band, Ivy Ford, Danielle Nicole Band, and Ronnie Baker Brooks. The Cashbox Kings bring Chicago Blues to the North Street Cabaret The groove starts to move around 8 pm. Check back for April dates and late-breaking McMusical news. They said it was impossible. “You can’t sell out a show if there’s no cover charge.” Right? Well, theoretically, Yes. Which is to say, No, you can’t. 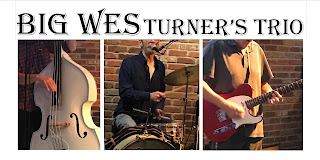 But theory and practice have been confounded before where the legacy of mythic musical mentor Big Wes Turner is involved. 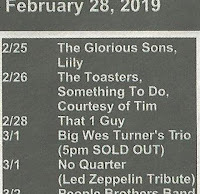 Thus this listing from the recent edition of Maximum Ink (Madison’s Music Magazine) for the upcoming March 1 early evening “Happy Friday” gig at the High Noon Saloon. Be it known! 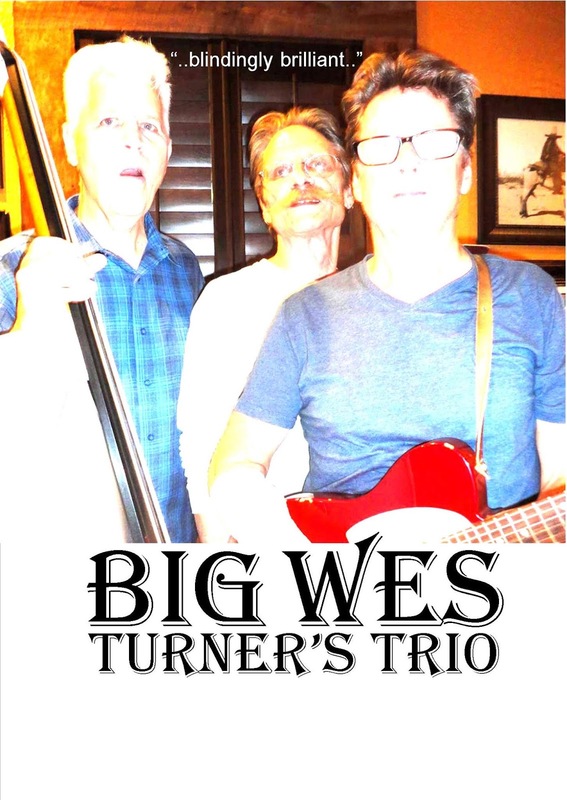 Big Wes Turner’s Trio’s 3/1 performance is NOT sold out, because there’s nothing out of which to sell. Except cocktails and cold beer at happy-hour prices. If you are ready to rock and roll on Wednesday, February 6, consider the High Noon Saloon and SIMO, guitarist/singer J.D. Simo’s band, three musicians who can power-trio in the best traditions of such. It’s been nearly two years since the trio handily passed the acid test of taste and chops by performing with high intensity at low volume for a special lunchtime Isthmus Live Sessions performance. You can find them all over Youtube, but here’s your chance to bypass the digital algorithmic overlords and strike a blow for live music resistance. 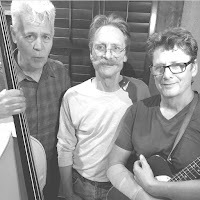 The Sparks Band, mostly masters of 60s nostalgia, rock out early at The Atwood (on Atwood Avenue) starting at 8 pm. Again, with The Sparks Band, plectruming playfully whilst the beer taps pour at Vintage Brewing in Sauk City. (On the shores of the mighty Wisconsin river.) Early evening pm. The brewery tour continues as The Sparks Band rips riffs nostalgically at The Great Dane Hilldale on Madison’s fashionable near-west side. 8 to 11 pm. The Cashbox Kings help Porchlight raise funds. Sample delicious dishes from great Madison restaurants while listening to Chess-era Chicago Blues sounds on the University Of Wisconsin-Madison campus. Contact Porchlight to get tickets for this delicious event. Madison’s musical A-Team, The Maintainers (featuring Frankie Lee on harmonica and Mel Ford on guitar) play for keeps at Chief’s (right across from Buck’s Pizza on Cottage Grove Road). 6:30 to 9:30. The Cashbox Kings bring authentic Chi-Town Blues sounds back to that most venerable of east-side dives, The Crystal Corner Bar. 9 pm. Calling all Parrotheads! That other venerable east-side eatery/drinkery, The Harmony Bar & Grill, hosts a fundraiser for WORT Backporch Radio. Waste away to the Jimmy Buffett-esque sounds of Chuck Bayuk & the Drunken Sailors. (Tom on bass, but drunken responsibly). Not sold out. No cover. Lotsa beer. The Cashbox Kings hit the Rothschild Pavilion at 5 pm to help celebrate 20 years of Wausau’s Blues Café. Other performers on the bill: The Mark Cameron Band, Ivy Ford, Danielle Nicole Band, and Ronnie Baker Brooks. The northern tour continues as The Cashbox Kings hit some joint in Stevens Point. Details will follow. The Cashbox Kings bring Chicago Blues north to the North Street Cabaret. The groove starts to move around 8 pm.